Meant to Live: What do you think about this Tweet posted by The Onion? What do you think about this Tweet posted by The Onion? We live in a world more concerned with political correctness than the generations before us. Sexist jokes, racist jokes and calling someone the n or the r-word are just not okay. Sometimes, people say Millennials are "too sensitive"or "can't take a joke." But to me, most of the time being politically correct is common sense and is about just being NICE to others. For me, the thing I'm most "sensitive" about are jokes related to suicide and mental illness. Mental illness is something people can't control. It's a disease. And, with suicide, that's someone's LIFE you're talking about. Joking around and saying things like, "You should just kill yourself" — it's not funny. Because...what if someone did? The website The Onion is a satire news organization known for pushing the envelope on political correctness. And I think a photo they tweeted Monday crossed the line. A friend of mine brought it to my attention and even reported it (although nothing was done). The Onion tweeted a picture of a dog with a noose in its mouth. 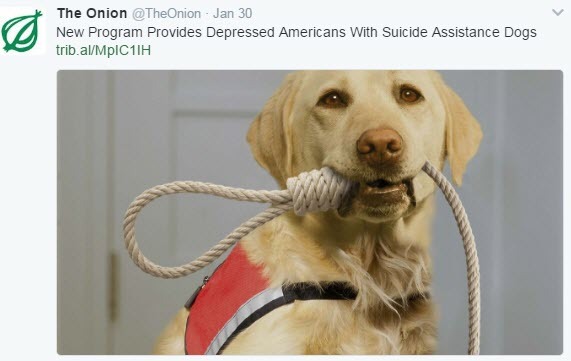 The Tweet reads: "New Program Provides Depressed Americans With Suicide Assistance Dogs" and references one of their old articles. Some people thought the Tweet was funny. Others thought it was in poor taste. For instance, Twitter user Althea Atherton, who is a suicide attempt survivor, said it could also be "empowering to suicidal thoughts." "It's a bad attempt at a pun with physician assisted suicide and assistance dogs. Not even a good one," she tweeted. Julie Brethauer tweeted, "Making fun of depression and mental illness is not funny. Unfollow," and Patricia Latendresse ‏tweeted, "I laugh at 99% of your articles. Count this in the 1%. Bad taste." I am always very conscious of things that may be a trigger for those suffering from depression. If just one person considers suicide because of a joke you told, is the joke really worth it, even if hundreds of people found it funny? I'm thinking no. For instance, in an article on The Mighty, contributor Deborah Greene wrote about one of her suicidal triggers — people making light of it. "Survivors of suicide loss spend much of our days dodging triggers. We sit down to watch a television show only to have a joke made about suicide. ... We try to tune into election coverage only to hear words like 'political suicide' tossed about," she wrote. "We survivors are everywhere. And there is nothing funny about the loss we are learning to live with. So how about we stop treating it like a punch line or a reasonable response to a moment of frustration. How about we treat it like the serious and painful issue that it is; an issue that claims another life every 12.8 minutes in this country." For anyone who saw this Tweet and it triggered something, first of all, call the National Suicide Prevention Lifeline at 1-800-273-8255. And please know this — there are more people who found it in poor taste than who thought it was funny. Know that you are not alone and that many other people feel the same way as you do. And please don't think you are being "sensitive" for feeling the way you feel. My feedback to The Onion is this: There are some things and topics we should joke about, and there are some we shouldn't. This, The Onion, was one of those times where you shouldn't have.